What goes into buying a home from beginning to end? Many first-time buyers want to know what the steps are, what to do, and what the process looks like. 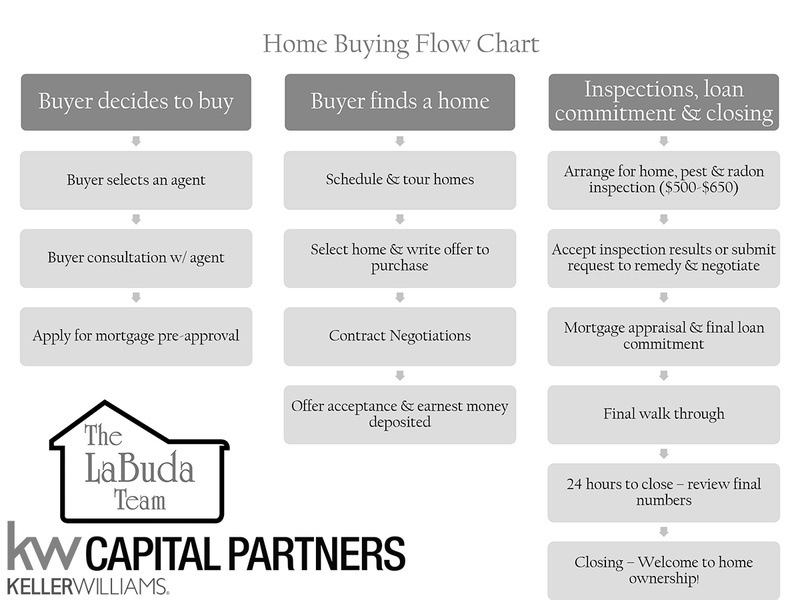 So, we’ve put together a typical home-buying steps list from the decision to buy, all the way through turning the key to open the door of your very own home! Deciding to buy. You’re finally ready, and your finances are in order, so it’s time to buy a home! This is the step that starts the journey to owning your own home. Congratulations! Apply for Mortgage pre-approval. Getting pre-approval from a lender of choice is a smart decision. This step allows a buyer to compete in a hot housing market, and helps you know EXACTLY how much home you can afford. It sets a firm budget and gives you an edge over buyers who have not secured financing. Select an agent. This important step is where you select your partner and guide for the process ahead. Choose someone with experience, who makes you feel heard and comfortable. Look for someone with a great team behind them, too. We’d love to tell you about the LaBuda Advantage! Buyer consultation. This is the meeting that sets the search for a new home into motion. Your agent will ask you about all of your needs, wants, and dreams for your new home. Listening carefully, they will begin forming a plan to help you find the perfect home for you. Schedule home tours. You and your agent will find potential matches, schedule viewings, and tour the possibilities. Take notes, photos, and even video. It’s surprising how the possible matches can blur into one another. Be clear and honest with your agent about what you like and what you do NOT like in each home, as that will help them narrow down the choices. Write an offer. So, you’ve found the home of your dreams! Now, it’s time to write an offer to purchase that home. This is one of the most exciting steps for any agent and buyer! Contract negotiations. Price, contingencies, and appliances…everything is negotiable. This is where you’ll appreciate the calm, wise perspective of an experienced REALTOR. Offer acceptance and earnest money. When your offer is accepted, you’ll write a check for the “earnest money”, which will be deposited in escrow. It’s a way to show you’re committed to buying the house if the contingencies are met. Inspection time! You’ll want to have your potential home inspected for defects, pests, and radon. These inspections usually cost between $500-700, and are a way to make sure you know exactly what you are purchasing. Accept results or submit request to remedy (negotiate again). Once the inspection results are in, you have the opportunity to accept the results or ask the seller to remedy the identified issues. The seller has the opportunity to negotiate the remedy or stick to the original terms. Mortgage appraisal. Once a final agreement has been reached between buyer and seller, the bank or mortgage company orders an appraisal of the home, and a final loan commitment is made. Final walk-though. The buyers and their REALTOR take a final tour of the home, making sure that the contract terms have been followed and ensures that the house is in the expected condition. It’s also the last chance to check that remedies have been completed as promised. Review final numbers. Your agent will want to walk you through the contract, preparing you for any additional closing expenses, informing you about the process of closing, and answering any question you may still have. You may be given reminders to set up the transfer of various utilities and other services from the seller’s name to yours, too. Closing. This is the contract signing and check exchange appointment. Many first-time buyers are surprised at how long it takes, as the contracts can be over 25 pages long with dozens of spots to initial or sign. Checks must be written by buyers and sellers to cover various fees and costs, and this all takes time. Once you are finished, you’ll receive your keys and codes to your brand-new home. Welcome home! From this point on, the home is yours. Congratulations, homeowner!